Although our updates have been sparse of late, our time at Solon Dixon has been nonetheless quite memorable. The last few weeks have included such things as intense sunburns, eastern indigo snakes, wild turkey and squirrel stew, and lizards lizards lizards! 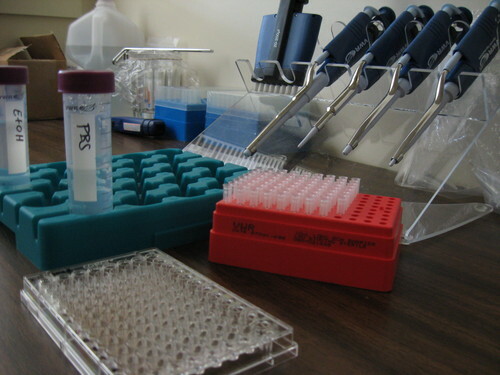 Last week, Sean and I collected blood samples from lizards and ran blood assays, which, as Nicole mentioned in the previous post, helps assess immune response. Sean has returned to State College, where he is analyzing data and flexing his mad writing muscles as he works on the manuscript for this project. After a nice stay at the Langkilde Lab Lizard Room at Solon Dixon, the lizards from this project were finally due to return to the wild. 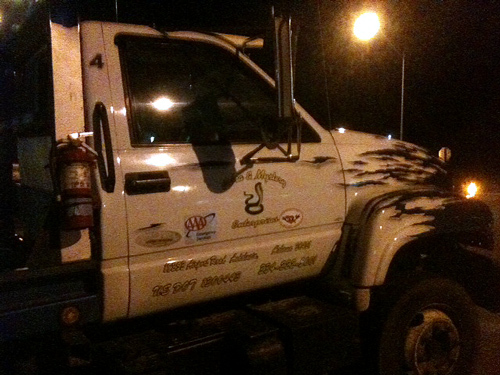 Chris and I chauffeured our lizard friends to their home sites in Alabama and Florida to see them safely off. 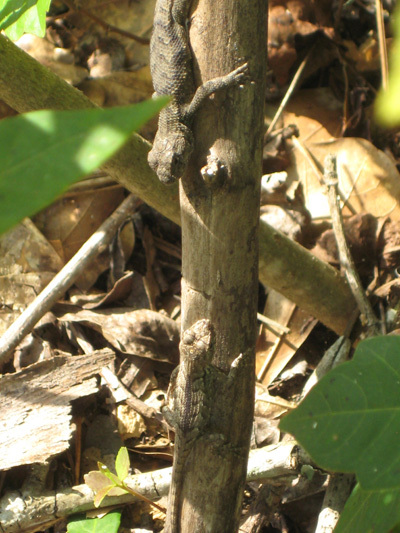 We will visit many of these sites again next summer; perhaps we will meet again, lizards! 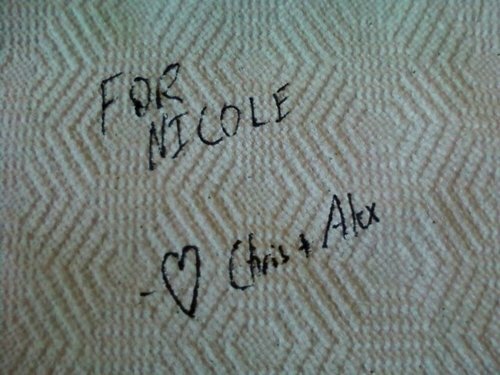 Alex and Nicole also said their farewells for the summer, and Chris and I have started to wrap things up around here. We have been busy cleaning the lizard room, packing up the lab, as well as tending to the enclosures. We recently found a baby glass lizard in one of the enclosures. 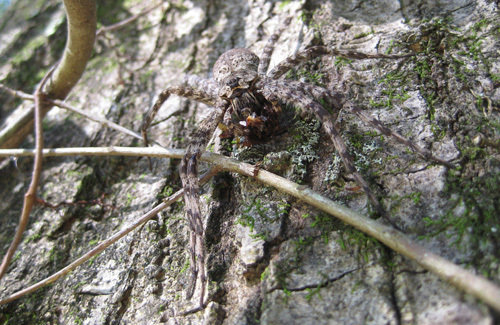 Because it is a potential predator, we caught and removed it from the plot. What a pretty potential predator! Great! Now you’re an expert! 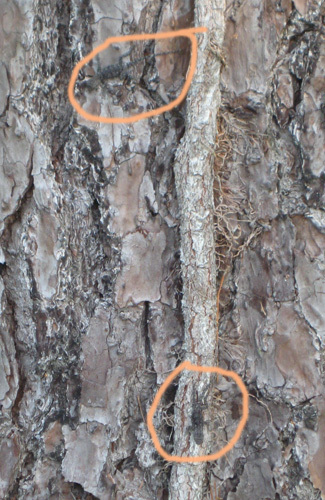 Earlier today, Chris and I were coaxing a lizard down a tree when we saw additional motion. Great, another lizard! Wait. Oh wait. That is very much not a lizard. 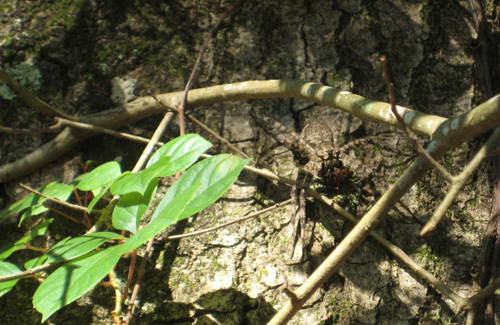 That is, in fact, a HUGE spider! With legs that look strikingly like a lizard’s tail. Classy, spider. Very classy. Categories: Summer 2011 Field Trip | Tags: enclosures, fence lizards, field trip | Permalink. Categories: Summer 2011 Field Trip | Tags: by Nicole, enclosures, field trip | Permalink. Wow – we’ve been on this research trip for over eight weeks! Time sure flies. 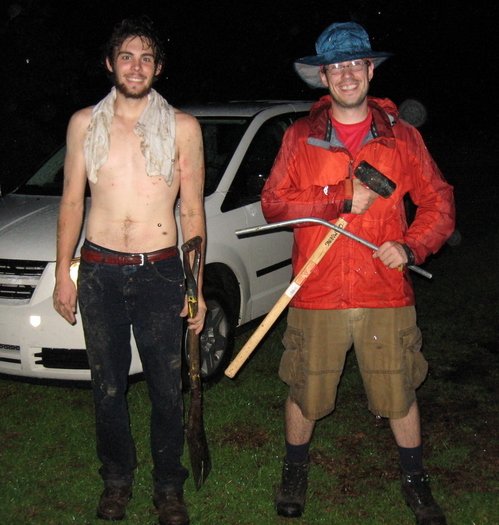 Sean and I went on a whirlwind trip collecting blood samples from lizards at six different sites in Florida, Alabama, Tennessee, and Arkansas. Shortly after getting back, I left for a quick trip home, and Sean went back to Auburn to defend his dissertation. Congratulations, Dr. Graham! Meanwhile, Chris presented his research at the Joint Meeting of Ichthyologists and Herpetologistsin Minneapolis by giving a talk entitled: Phylogeography and Invasive Spread of Two Cuban Anurans in the Southeastern United States. Alex successfully held down the fort while the rest of us were gone. And although lonely and suffering from a bit of cabin fever, he took excellent care of the lizards in our absence. In the next few weeks Sean and I (and Gail, once she arrives) will be collecting more blood samples from wild lizards to test their immune response. 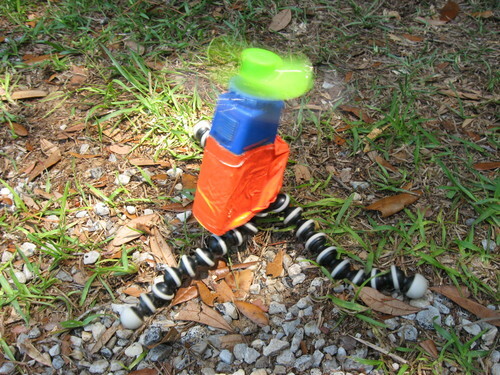 While in the field, we use Sean’s homemade centrifuge (photo below), comprised of a flexible tripod (my addition) duct-taped to a battery-operated personal fan, to spin down the blood samples. Our microcentrifuge tubes conveniently fit in the hand-crafted wire holders attached to each fan blade. It’s a true work of art. 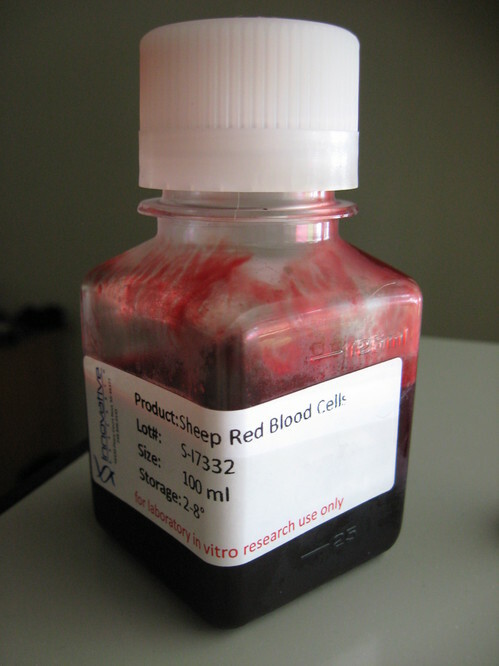 We will be measuring initial (baseline) and secondary immune response of lizards to sheep red blood cells. This sounds a bit strange, but is a common ecoimmunology protocol. Categories: Summer 2011 Field Trip | Tags: by Nicole, fence lizards, field trip | Permalink. What’ve They Got in There…King Kong? At long last, our project building the enclosures has been completed. Nicole posted a compilation video earlier, but I decided to give a full walkthrough of the process to show the lengths that we’re going to to ensure that our enclosures last the whole season (and keep all their occupants inside!). 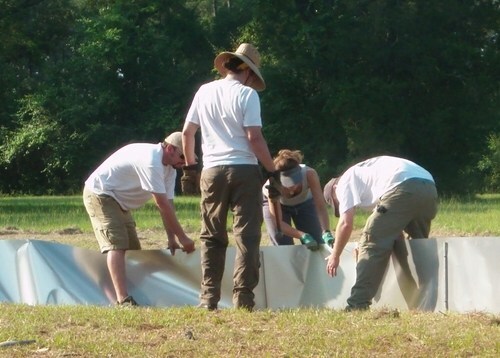 Before any real groundwork was done installing the fences, Travis and I spent an inordinate amount of time planning the layouts of the enclosures to make sure that the habitats inside were as similar as possible between the four plots. We dusted off our long-disused geometry skills and checked and double-checked our calculations to verify that the areas of each plot were the same. 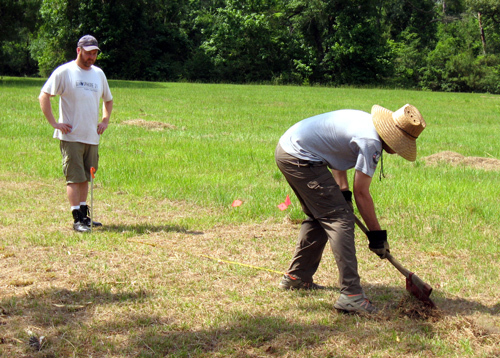 After our final bout with compasses and tape measures, we began scratching the outlines of each enclosure into the ground with a fire axe (see below). Travis holds the line while Chris scratches out the enclosure boundaries. With our outlines in place, we rented a groundsaw (as seen in the earlier video and below) to cut trenches to lay the fence in. A groundsaw lives up to its name, as it is a device like a huge wood saw blade with a gas engine that is mounted onto three wheels. A screw raises or lowers the blade, and one/two people pull it backwards as it digs a 2 inch wide trench in the earth. Sean and I focused on pulling the groundsaw while Travis and Nicole became experts in the construction of the fences themselves. Travis was the reigning expert in building enclosures for fence lizards, although all of us have had experience building drift fences for various research projects. 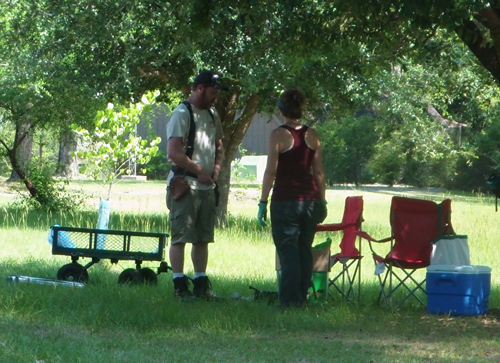 Travis planned well in advance for putting the fences together and brought a selection of gear to help him, including a pro-level tool belt with suspenders. Putting in a section of fence involved clearing the trench of any remaining roots and then placing one side of a 50 ft roll of flashing into the trench. We sank 2.5 ft posts of electrical conduit every 1.5 m (or as needed), and pulled the flashing as tight as possible against the poles. While holding the flashing, Travis used a tool he created himself to simultaneously punch a pair of holes in the flashing at the top and bottom of each pole. Zip ties were used to secure the flashing to the pole and the extra bits were clipped of to ensure that enterprising lizards don’t have anything to grab a hold if they attempt to escape the enclosures. 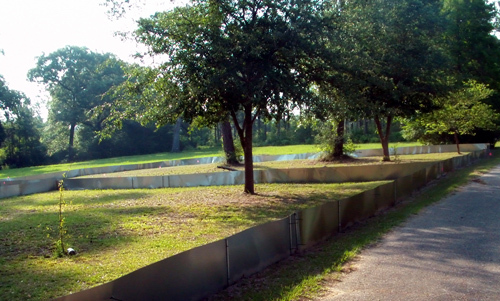 Once the fences themselves were complete, we standardized the amount of cover inside each enclosure by removing extra shrubberies. 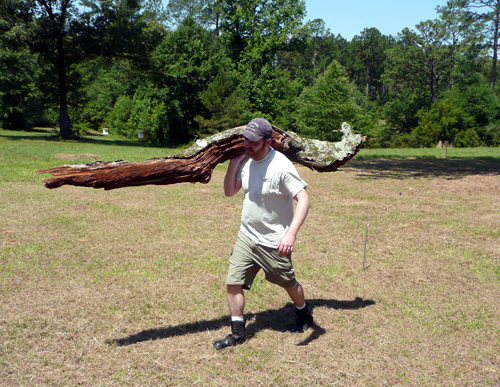 We also created extra cover for the lizards by bringing in pallets and branches to serve as hides and perch sites. 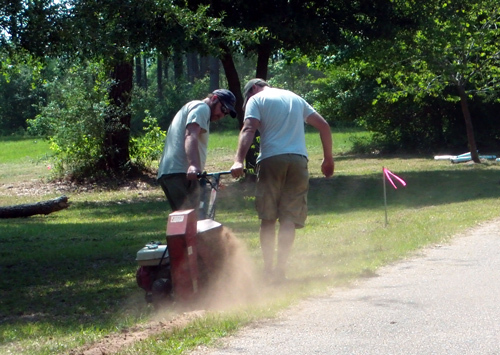 Taking shovels in hand, we carefully filled in any gaps along the fence edges by trucking in dirt and sand. 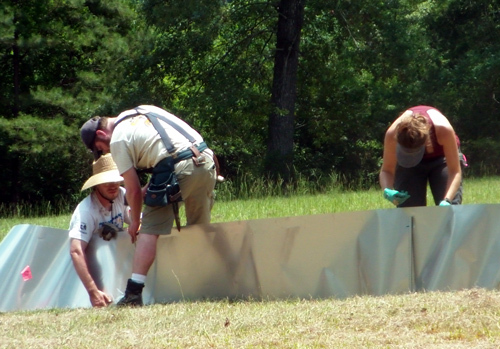 After three solid days of work in the brutal Alabama summer, the shiny new enclosures passed their final inspection and were ready for their lizards occupants. All they lacked was a volunteer fire-ant-fighter company and a slew of lizards to enjoy their stays (detailed in future updates). Our number of herpetofauna species encountered on this trip continues to grow, and as of this point is close to 40, I think. Chris has the official list and will hopefully write a blog entry about it soon. 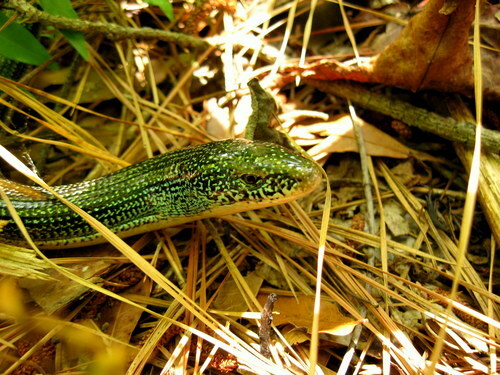 Yesterday I saw two species that I’ve never seen before – an eastern glass lizard (Ophisaurus ventralis) and a pigmy rattlesnake (Sistrurus miliarius). 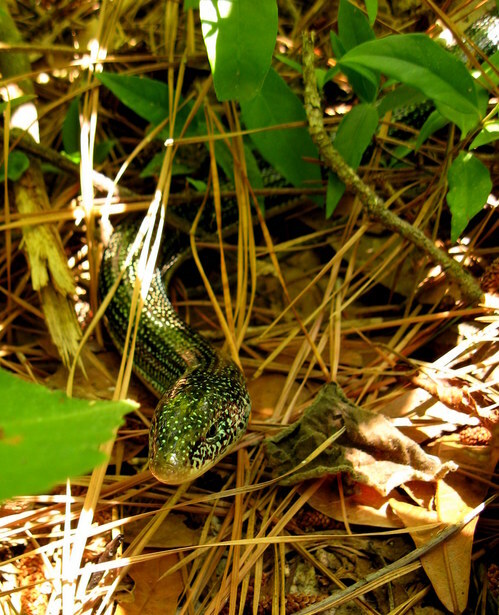 The glass lizard was found by Chris and Alex on their way to Chris’ enclosures. Knowing I had never seen one, they kindly brought it back to the dorms and left it in our kitchen/living room with a note written on a paper towel. I didn’t see the note, as it had been blown off the table by the air conditioner, and simply discovered a knotted pillowcase sitting on the floor. Wondering what was inside, I gently poked at it and then opened said pillowcase. Upon looking in, I said to myself, “I think this is a glass lizard.” My suspicions were verified shortly thereafter by Sean. When Chris and Alex returned later I thanked them for the lovely surprise. 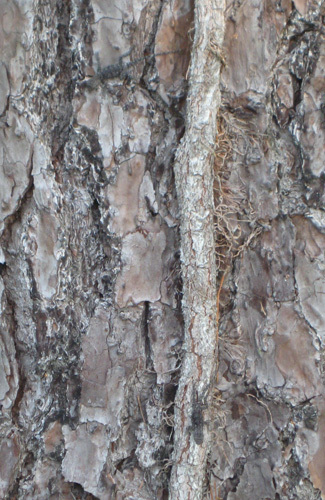 I then returned the lizard to where they caught it and tried to get some “natural” photos. 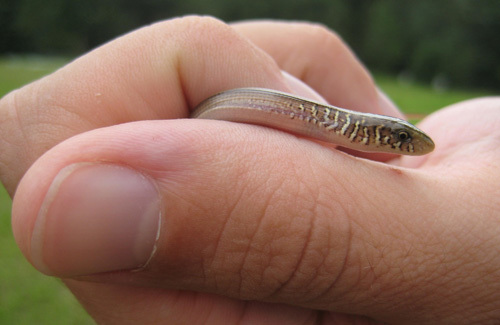 Glass lizards are super cool because they have no legs and really long tails, and if you didn’t know better, you could easily misidentify one as a snake. And then last night, we found a decent number of snakes while road cruising, most of which were copperheads and alive (yay!). We were very pleasantly surprised to discover what Sean initially thought was a small copperhead (while driving past it), was actually a pigmy rattlesnake! Super exciting! 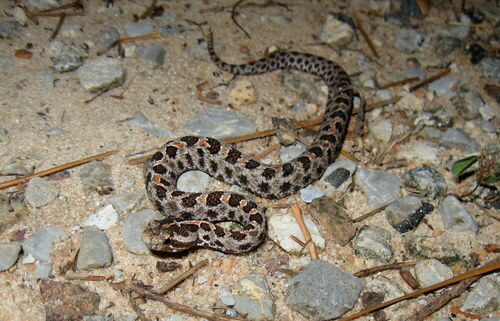 It was hard to believe such a cute little snake could hurt you if you accidentally (or stupidly) picked it up. I can definitely see how pigmies can be mistaken for nonvenomous snakes. Yikes. 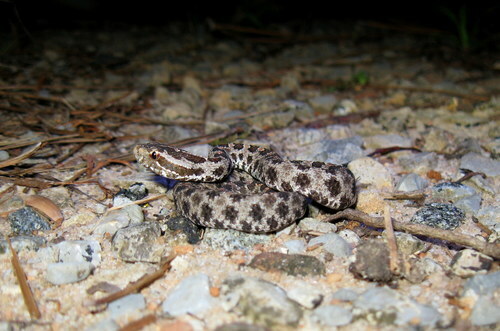 Categories: Summer 2011 Field Trip | Tags: by Nicole, field trip, herps | Permalink. May 27th started well enough for our lizard team, with construction work on the enclosures filling the morning, and a supply run occupying the afternoon. As we set off after lunch in our then-trusted minivan to buy tools, materials, and groceries, little did we realize the epic journey of frustration we were embarking on. Travis and I worked through our to-do list in Andalusia and, before stopping at Walmart for the last of our groceries, we pulled in to Sunbelt Rentals to check prices on Ditch Witch rentals (for digging in the enclosures). As we mentally prepared ourselves to enter the fascinating cultural wonderland of the Andalusia Walmart, Travis slid the electronic fob* into the dash, turned the ignition, and…nothing happened. Travis twisted the key several times in rapid succession and looked at me in confusion and disbelief. He flipped the lights on and off along with the wipers, proving that the battery was fine. We switched seats, and I tried turning the fob with the same results. We both glared at said fob and cursed the engineers who decided that fancy-dancy electronics were better than actual keys. Using a still functioning piece of technology, Travis’ iPhone, we left a voicemail for Nicole asking for assistance, and then proceeded to analyze our situation and formulate alternative plans. We needed a vehicle to get supplies for the fence and as transport to our field site, so being without one would seriously cripple our ability to do work. Our plans were as follows: Plan B: Check with fleet services at PSU to get our car fixed quickly (not possible late Friday afternoon of Memorial Day weekend); Plan C: rent a car to use as a field vehicle (not possible late Friday afternoon of Memorial Day weekend), Plan D: Get Nicole to somehow get a car and pick us up (not possible late Friday afternoon of Memorial Day weekend); Plan E: Flag down a passing DeLorean, hit 88 mph, travel back in time to May 15th and get a car with a real key (not possible IRL); or Plan F: Chris and Travis have died of dysentery and frustration. In the end, we followed Plan Q.5378: Head to Walmart, get towed by the craziest tow truck ever, and get picked up and driven home by a clutch friend. After another round of frantic fob twisting, pulling off parts of the ignition, futilely attempting to start our van with the valet key, and realizing that the odometer actually did say “bad key” instead of the mileage of the van, we called the only AAA-approved tow company in Andalusia, an outfit known as Cobra & Mystery Enterprises. No, we are not making this up. As I headed to Walmart to purchase enough food, drink, and supplies to last for an extended period of carlessness, Travis once again worked his iPhone magic, juggling calls to the PSU motor pool, the local Dodge dealership, and the unintelligible director of Cobra & Mystery Enterprises, and setting up a sanity-saving ride from our friend Mark Hainds, a local naturalist, accomplished hoghunter, and longleaf pine expert. As the sun softly slid below the horizon and the stars winked into sight, your narrators were still left cooling our heels in the parking lot of Sunbelt Rentals. 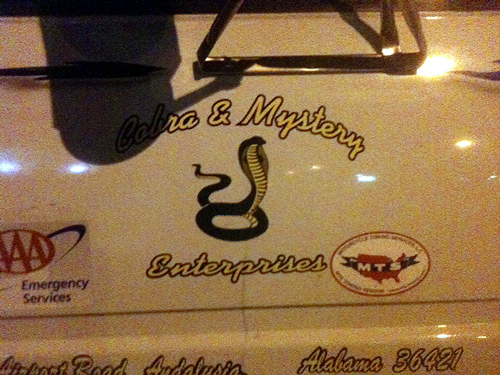 An estimated wait of 30 minutes for a tow had stretched to over an hour, and we began to wonder if the “mystery” of the Cobra & Mystery Enterprises was if the truck would ever show. After several more raspy, near-unintelligible phone calls to the tow truck operator, our efforts were rewarded with quite the vision, a cobra-adorned tow truck sporting metallic blue flames across the hood rolled into the lot next to us (Pics below). Note the prominently displayed AAA certification to convince customers that they aren’t becoming stars in a B-grade horror flick. The driver hopped out of his cab, blocked his tracheotomy stoma with one hand, and began chaining our poor van to the back of his outrageously decorated truck. As the tow truck pulled away to deliver the van to the Dodge dealership for repair, Mark Hainds arrived, loaded us and all of our supplies into his car, and took us back to Solon Dixon. As of this post, it’s been 10 days since the van’s failure to start, and it’s still sitting in a parking lot in Andalusia. We’ve rented a bright, red, ticket-magnet of a truck so we can do research, finished the enclosures and another set of behavior trials, and managed to waste over a day of each of our lives dealing with the minivan. Really, though, we’re just grateful to still be alive after our surreal evening of Southern gothic. **Editor’s Other Note: 3 seconds after seeing this fob in State College, Chris said, “What do we do if this breaks?” The answer is above. Categories: Summer 2011 Field Trip | Tags: field trip | Permalink. It’s taken about about a week, 24 rolls of aluminum flashing, 80 rods of electrical conduit, and about a million zip-ties, but we are almost done building the outdoor enclosures that Chris will be using to conduct experiments on the effects of fire ants on lizard survival this summer and next. I wouldn’t say it was fun, but I suppose it could have been worse. And fortunately, we didn’t have any major accidents involving heavy machinery, etc. I’ve assembled a short compilation video showing our progress (below). What you can’t see in the video is that it was close to 100 degrees outside and we were all pretty miserable. Or maybe it was just me. Categories: Summer 2011 Field Trip | Tags: by Nicole, enclosures, fence lizards, field trip | Permalink.